Enhance productivity and collaboration across your business with the simple to use Polycom VVX 501 desktop UC phone designed to deliver a personal communications experience for todays busy managers and knowledge workers. The Polycom VVX 500 series is designed for a broad range of UC environments, and provides a powerful yet intuitive office phone device with a simple touch-screen interface that’s easy to configure, deploy and manage throughout your organisation. The Polycom VVX 501 phone provides superior voice capabilities with a multitouch, gesture based user interface for simple navigation, high-performance communications. The Polycom VVX Business Media phones are Skype for Business and Microsoft Cloud PBX integrated, meaning they seamlessly calendar with Microsoft and enable users to experience the extreme quality of Polycom audio, video and content, with the familiarity of Microsoft UC. 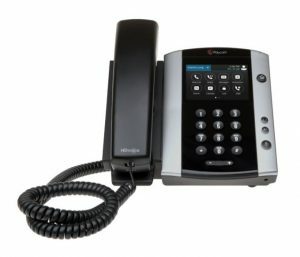 The Polycom VVX-501 has been qualified by RingCentral as the leading high-end desk VoIP phone to integrate with your RingCentral business service. 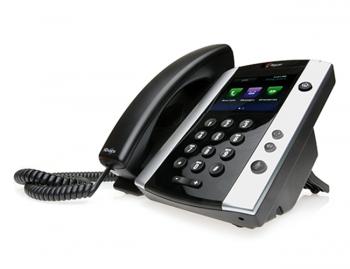 Utilising standard SIP protocol, the Polycom VVX 501 office phone offers a host of call processing features that rival your standard desk phone, including voicemail, call waiting, call forwarding etc. “This is the ideal media phone for the business executive or any team member handling multiple calls and requiring the latest in technology, inputs and interoperability. Get in touch with VideoCentric, accredited Polycom integrator, to discuss whether the Polycom VVX 501 is right for your business, or to find out more about the range of VVX phones or other desktop VoIP phones available in the market today.